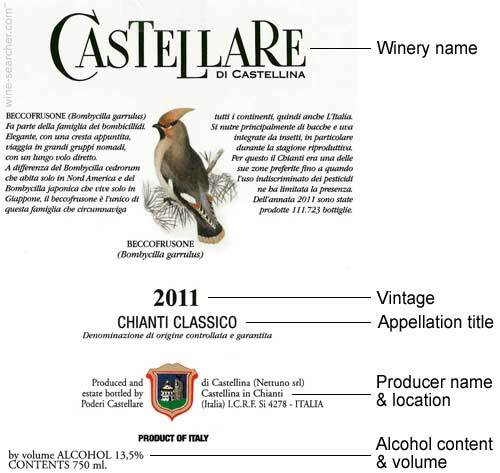 Her is an annotated label, and below an overview of Italy’s wine classifications and label terminology. DOCG (Denominazione di Origine Controllata e Garantita) is the highest classification for Italian wines. It denotes controlled (controllata) production methods and guaranteed (garantita) wine quality. There are strict rules governing the production of DOCG wines, most obviously the permitted grape varieties, yield limits, grape ripeness, winemaking procedures and barrel/bottle maturation. Every DOCG wine is subject to official tasting procedures. To prevent counterfeiting, the bottles have a numbered government seal across the neck. See Brunello di Montalcino DOCG. DOC (Denominazione di Origine Controllata) is the main tier of Italian wine classification, and covers almost every traditional Italian wine style. There are around 330 individual DOC titles, each with a set of laws governing its viticultural zone, permitted grape varieties and wine style. Those which show consistently high quality earn promotion to DOCG status. See Pinot Nero DOC. IGT (Indicazione Geografica Tipica) was introduced in 1992, to allow a certain level of freedom to Italy’s winemakers. Prior to 1992, many wines failed to qualify for DOC or DOCG status – not because they were of low quality, but because they were made from grape varieties (or blends) not sanctioned under DOC/G laws. The IGT classification focuses on the region of origin, rather than grape varieties or wine styles. See Toscana IGT. Vino da Tavola: means ‘table wine’ in Italian, and represents the most basic level of Italian wine. The Vino da Tavola category held a certain prestige in the 1970s and 1980s, thanks to experimental winemakers who produced top-quality (but unorthodox) wines under the title. This situation has gradually diminished, however, since the introduction of the IGT category with its more flexible production conditions, and Vino da Tavola has steadily returned to its original status as the lowest rung on Italy’s wine quality ladder. This useful but unofficial term emerged in the 1970s, to describe a particular set of high-quality Tuscan wines which were precluded from claiming DOC or DOCG status because they broke traditional Italian winemaking norms (foreign grape varieties were used, and the wines were often matured in small, new oak barrels). Several of these wines earned global recognition and astronomical price tags – hence ‘Super Tuscan’. Originally these wines had to be labeled as Vino da Tavolabecause they contravened the stringent, tradition-focused DOC laws. This situation ultimately led to the creation of the IGT category, with its relatively relaxed production rules. Previous Post What are Wine Scores?